Action from Peterborough Sports v Yaxley in December. 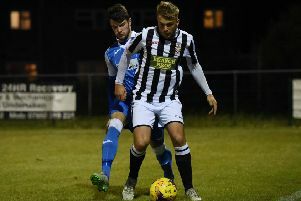 Recently crowned United Counties Premier Division champions Peterborough Sports have a couple of tasty-looking league derbies over the Easter weekend. Sports travel to Yaxley tomorrow (April 14, 7.45pm) before hosting city rivals Peterborough Northern Star on Monday (April 17, 2pm). Spalding United will clinch a place in the play-offs of Division One South of the Northern Premier League with a point from Saturday’s (April 15) home match with Bedworth. Three points would secure a home draw in the play-off semi-final. Three points would secure a home draw in the play-off semi-final. Spalding still have three regular seasons games left to play. Premier Division: Wisbech Town v Sleaford Town (1.30pm), Yaxley v Peterborough Sports (7.45pm). Division One South: Spalding Utd v Bedworth Utd, Witton Albion v Stamford. Premier Division: Holbeach United v Boston Town, Oadby Town v Deeping Rangers. Division One South: Lincoln Utd v Spalding Utd, Stamford v Rushden & Diamonds. Premier Division: Peterborough Sports v Peterborough Northern Star, Huntingdon Town v Yaxley, Wisbech Town v Holbeach United.